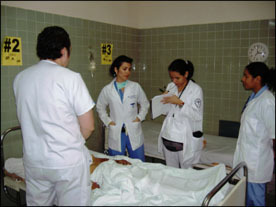 Hospital Mario Catarino Rivas, in San Pedro Sula, Honduras, is a large public hospital and trauma center in the country's second largest city and primary industrial center. Serving a population of more than one million, it is a regional referral center for a variety of illnesses, including acute trauma. In October of 2007, I spent a month working in their emergency room, mostly in their trauma ward. Their trauma unit is staffed by surgeons, who tend to spend most of their time in the operating room, if they can. This usually leaves the department in the hands of medical students and interns, who will pull their supervising surgeon out of the OR when confronted with cases beyond their expertise. As I am not a surgeon, and more interested in emergency medicine, I had a unique opportunity to spend most of my time in the emergency room, supervising the running of the emergency room for extended periods of time. As the largest public hospital outside of the capital, Catarino Rivas is the only source of care for a large proportion of the population. Consultations and most care are free, although patients or their families are required to pay nominal fees for all diagnostic tests and pharmaceuticals. Most families are able to pay, as the fees are minimial and certainly much less than would be required at the various private hospitals in the city. Surgical services are readily available, including 24-hour trauma surgeons, and on call vascular, cardiothoracic, urologic, and vascular surgeons. Catarino Rivas does not have a working CT machine (it has been broken for many months without funds to repair it), and only has ultrasound capabilities during the day, so trauma patients either go to the operating room empirically for exploratory laparotomy if severe injuries are suspected, or are observed in the department, often for many days if needed. If the family can afford it, stable patients who require CT scans are often transferred to the private hospitals for their scans and then transferred back, at their expense. Alcohol-related injury is common, as it is in the United States. However, the nature of injuries differs in that the most common alcohol-related injury is the machete wound. Often these are self inflicted due to the all-too-common combination of substance abuse and a culture where machetes are as ubiquitous a masculine accessory as a baseball hat. It is not unusual to see three or four of these injuries a day, often resulting in the loss of digits or entire hands. I was very impressed with the physicians I worked with. They were all excellent diagnosticians, having to rely more on their abilities and less on lab tests and radiology. Having to do more, with less, Hospital Catrino Rivas has cultivated a well-trained and confident staff that understands both their limitations and abilities. I am honored to have worked with them.